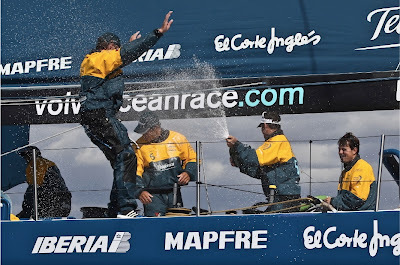 Team Telefónica surged to victory in Saturday’s Cape Town V&A Waterfront In-Port Race to strengthen their overall lead after PUMA Ocean Racing powered by BERG had briefly hinted a fairytale comeback to the Volvo Ocean Race. Telefónica, first into Cape Town at the end of Leg 1, led from the start in warm sunshine and breezes averaging 14 knots in Table Bay, only for PUMA’s Mar Mostro to sneak past them at the first mark. Ken Read’s team, who only arrived in Cape Town midweek after becoming the third team forced to retire from Leg 1, then looked to be in a strong position but a sail handling mistake allowed Telefónica and CAMPER with Emirates Team New Zealand to streak past them on the way to mark 5, after which there was no way back. Telefónica, last in the first in-port race in Alicante, finished the Cape Town V&A Waterfront In-Port Race in 52 minutes 55 seconds, with CAMPER with Emirates Team New Zealand in second 43 seconds back and PUMA third a further nine seconds behind them. 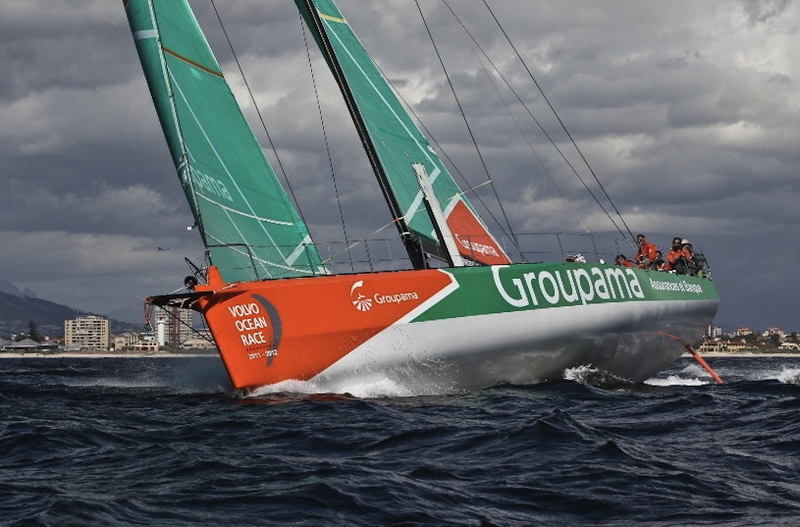 Abu Dhabi Ocean Racing were fourth, Groupama sailing team fifth and Team Sanya sixth. 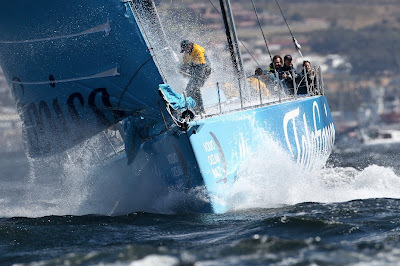 The result sees Telefónica consolidate first place overall with 37 points, followed by CAMPER with 34 and Groupama 24. PUMA and Abu Dhabi are tied on nine points, with Sanya on four. "Second is good but unfortunately it puts us further behind the leaders on points,” said CAMPER skipper Chris Nicholson. “The start cost us but after the start we had a nice march on. Hats off to the guys on board. The crew work was very nice. There were some high pressure manoeuvres that came through nicely." For PUMA and the other two teams forced to retire from Leg 1 – Abu Dhabi with a broken mast and Sanya with a massive hole in their hull – it was a real achievement just to make it to the start line. That PUMA hinted at one of the great comebacks in the race’s history was scarcely credible. PUMA, who lost their rig in the south Atlantic in Leg 1 and had to seek refuge at the impossibly remote Tristan da Cunha, only got the boat back to the shore base in the early hours of Wednesday morning. After hours of round-the-clock graft, they had the replacement mast back in and on Saturday it looked like they had never been away. Telefónica led from the beginning, blasting through the start line with their spinnaker flying to take an early gain. PUMA and Telefónica, both latest generation designs from Juan Kouyoumdjian, had raced neck and neck at the front of the fleet for days on end in Leg 1 and Read’s team stuck close once again. By mark one PUMA had reeled them in, rounding 14 seconds ahead of their Spanish rivals. After splitting from the leaders after mark 1, Abu Dhabi Ocean Racing and Groupama took advantage of a shift of wind direction and pulled back vital ground, all six teams rounding mark 2 within two minutes of each other. It was a lead PUMA were to enjoy until a crucial moment after the fourth mark. Telefónica made their move by gybing away from PUMA and were followed by CAMPER. Sail choice – PUMA having to go for reaching sails while Telefónica and CAMPER went for downwind sails – proved critical and by the time the split boats came back together Martínez’s men were in front, PUMA having to settle for third place rounding mark 5. Read explained that they had been forced to gamble on their sails. “We blew our kite at the leeward mark when we were leading and we had to take a chance and it didn’t work,” the American skipper said. “Iker gave us a bit of an opening and I put too much pressure in the kite so I will put my hand up to that mistake. Once out in front Telefónica didn’t look back, crossing the line 400 metres ahead of CAMPER, who took second place ahead of PUMA. The teams are straight back in action on Sunday with Leg 2 to Abu Dhabi, starting at 1300 UTC/GMT. The route has been redrawn for the second leg because of the threat of piracy in the Indian Ocean, with the teams due to make for an undisclosed safe haven port and then be transported by heavy lift ship to a position off the Sharjah coastline in the northern Emirates. From there they will sprint in to Abu Dhabi for the finish.